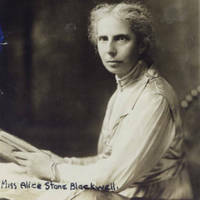 Portrait of "Miss Alice Stone Blackwell" (1857-1950), daughter of Lucy Stone and Henry Blackwell and founder and editor of The Woman's Column. From the Carrie Chapman Catt Albums. 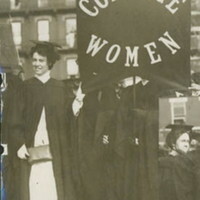 College Women selling The Woman's Journal. From the Carrie Chapman Catt Albums. 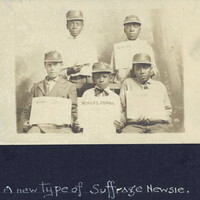 "Newsies' and College women selling the Woman's Journal and Suffrage News." 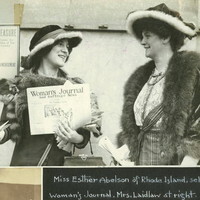 "Miss Esther Abelson of Rhode Island, selling Woman's Journal. Mrs. Laidlaw at right." From the Carrie Chapman Catt Albums. 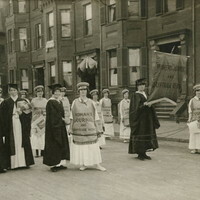 "Publicity Float in Suffrage Parade." 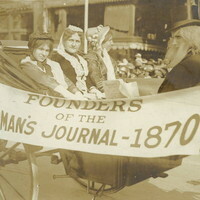 The founders of The Woman's Journal ride in a parade float. From the Carrie Chapman Catt Albums. 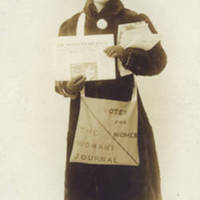 "A New Type of Suffrage Newsie" selling The Woman's Journal. From the Carrie Chapman Catt Albums. "Florence A. Luscomb. of Boston, Selling Woman's Journal Feb. 18th 1913." 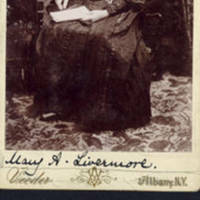 Portrait of Mary Ashton Rice Livermore, 1820-1905. "Abolitionist, Suffragist and Temperance worker. 1821-1905. Founded "The Agitator' in 1869. First Editor of Woman's Journal in 1870"
Selling The Woman's Journal on Wall Street. 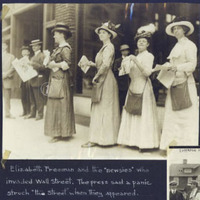 Caption reads "Elizabeth Freeman and the 'newsies' who invaded Wall Street. The press said a panic struck 'the street' when they appeared." From the Carrie Chapman Catt Albums. 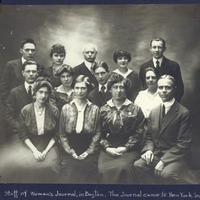 "Staff of Woman's Journal, in Boston. The Journal came to New York in 1916."